One of the UK's largest car research and development plants is celebrating its 40th birthday by planting the last of 40 trees. Ford Dunton near Basildon, in Essex, was opened on 12 October 1967 by Prime Minister Harold Wilson. The centre is home to an engineering team of 3,000 people working on future commercial vehicles and the latest developments in low-carbon technology. The Prince of Wales planted the first of 40 trees in July. Head of Dunton Graham Hoare and his predecessor Malcolm Thomas are to plant the 40th tree later. Every employee will get a brochure about the site from 1967 to the present day, before listening to 1960s music from tribute band The Bandit Beatles. 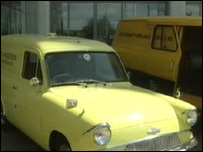 Since 1967, the plant has developed vehicles such as the Ford Granada, the Fiesta XR2 and the Sierra XR4x4.